Like its predecessor, the new Ninja 300 has styling that would not be out of place on our larger-displacement Ninja supersport models. 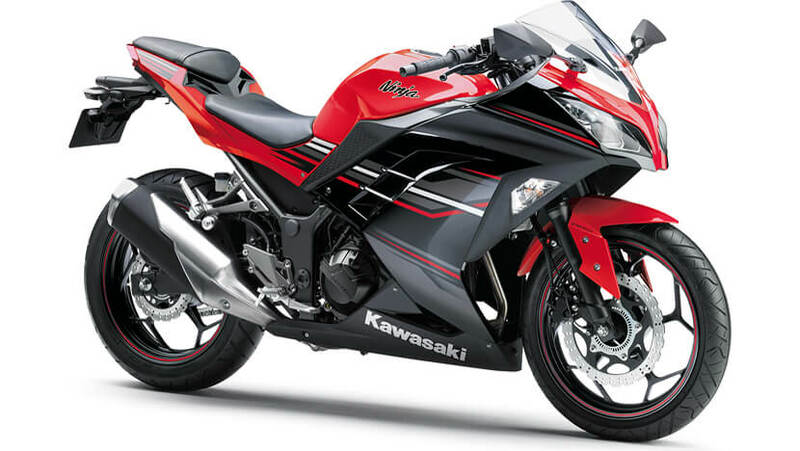 Just like the other machines in the Ninja series, it features a sporty new “mass-forward, minimalist-tail” design. From its aggressive new dual headlights to its new screen and wheels, the new Ninja 300 shares numerous styling cues and design elements from other machines in the Ninja family. One look tells you that this bike is pure Ninja. 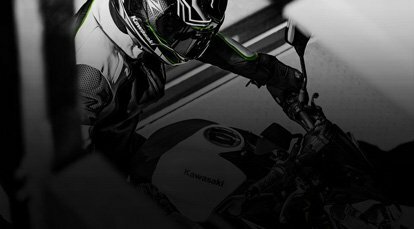 Whether referring to engine or chassis performance, or the latest available technology, the name “Ninja” implies the very best that Kawasaki has to offer. In the case of the all-new Ninja 300, it means a larger-displacement 296 cm3 engine with the power and torque to eclipse everything in its class, racetracklevel chassis stability, and race-derived clutch technology that offers a supersport-style back-torque limiter and increased ride feel. 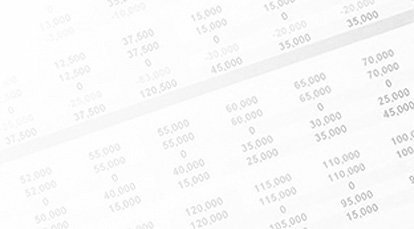 Reduced vibration and new heat management technology result in high-quality ride feel and comfort level one would expect from a much larger machine. Designed for rider-friendly response, the Ninja 300’s fuel-injected Parallel Twin engine delivers smooth,responsive torque at low and medium rpm and hard-hitting acceleration at high rpm. Now displacing 296 cm3, the engine offers significantly stronger torque and power at all rpm, putting the Ninja 300 in a class of its own. 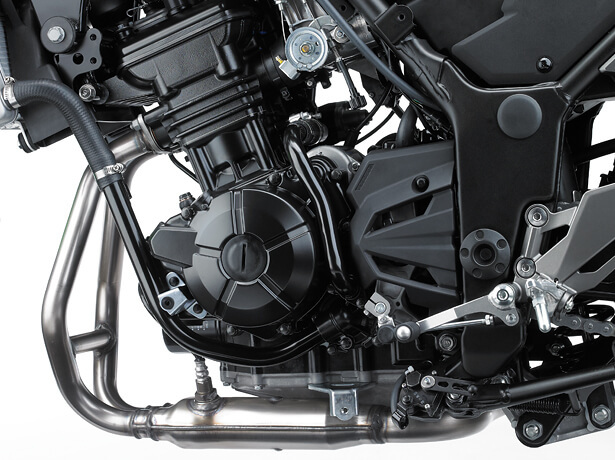 The new engine is fitted with a sleeveless, plated, die-cast aluminium cylinder. New cylinder head, lighter pistons, new crankcases and oil pan (offering increased engine cooling) are just some of the new engine parts.Complementing the enhanced engine performance, racing-derived clutch technology offers a lighter clutch lever pull and a back-torque limiting function, while heat management technology like the new radiator fan cover directs heat away from the rider, significantly improving rider comfort. Innovative Kawasaki technology like the new radiator fan cover (patent pending) located behind the radiator directs hot air down and away from the rider, significantly increasing comfort when stuck in heavy traffic. Redirecting the air also helps keep the tank, frame and other parts that contact the rider cooler, further increasing rider comfort. 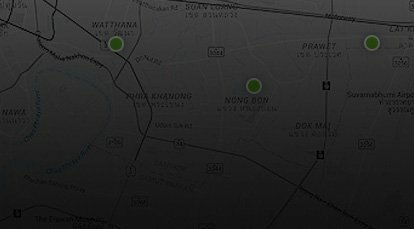 Touches Aggressive new design follows the latest Ninja series trends. Like the Ninja ZX-10R, the new Ninja 300 features a “mass-forward, minimalist-tail” design. 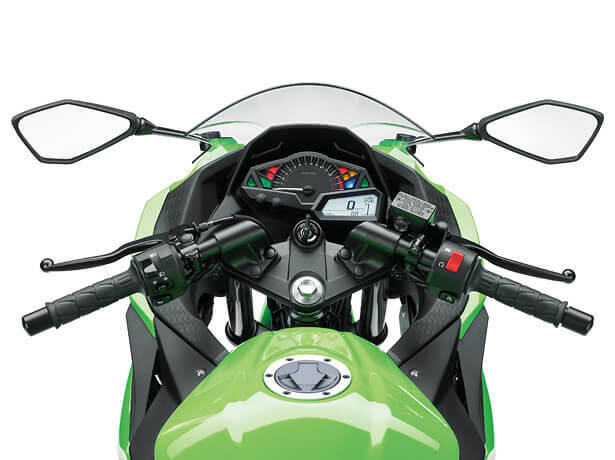 Like the Ninja ZX-10R, the new Ninja 300 uses a floating-style windscreen with a gap between the cowl and the windscreen. Mounting the screen using only the bolts from the mirror stays contributes to a very clean and elegant design. 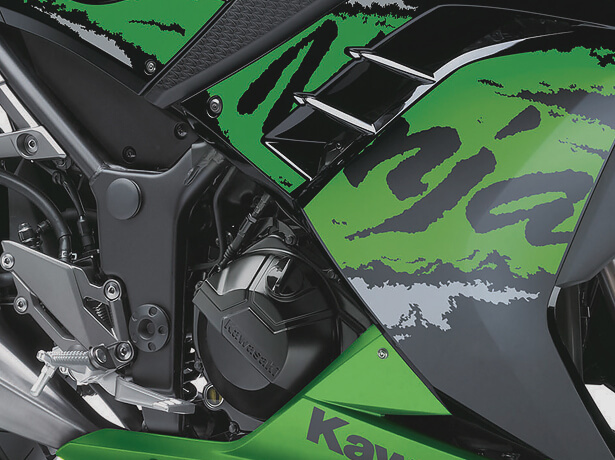 Fin design and large ventilation holes in the fairing have a design similar to that of the Ninja ZX-14R. 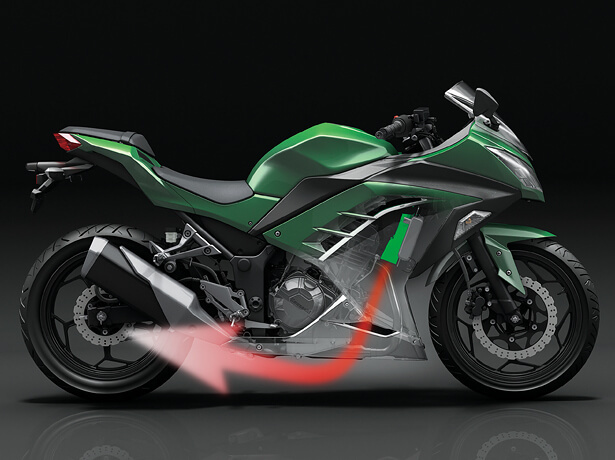 The design contributes to the Ninja 300’s excellent heat management.